For such a picturesque and unassuming structure, the Fairport Harbor West Breakwater Lighthouse's inception was a source of deep consternation for the inhabitants of Fairport. Because Fairport Harbor Lighthouse was falling into disrepair, in 1917 Congress appropriated $42,000 for the construction of a new breakwater light; however, some of the funds were to be used to demolish the existing lighthouse. The citizens of Fairport rallied in defense of their beloved landmark, and the Secretary of Commerce agreed to let the lighthouse remain standing even as plans were made for the new breakwater light. With the outbreak of WW I, construction on the new lighthouse was delayed for several years. 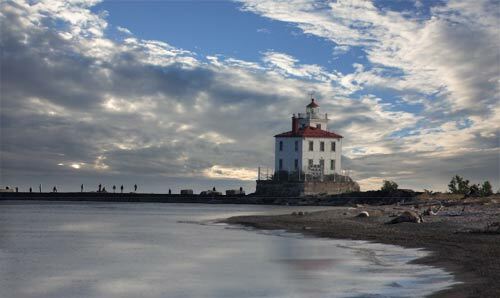 In June of 1925, the Fairport Harbor Breakwater Lighthouse was illuminated for the first time. Fairport Harbor Breakwater Lighthouse is now automated and its Fresnel lens has been replaced with a 300 mm optic. Still an active aid to navigation, it is owned and managed by the Coast Guard, and is currently closed to the public. However, visitors wishing to get a better look at the light can walk along the breakwater. 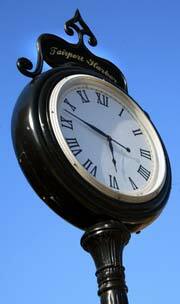 Up until the Civil War, Fairport Harbor was the final Ohio destination spot for many run-away slaves using the Underground Railroad. Fairport Harbor provided boat passage for the escaping slaves that would take them to Canada and safety from bounty hunters prowling the country-side looking for them. 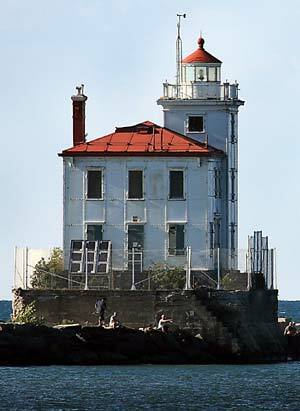 Efforts are currently underway to restore the Fairport Harbor Breakwall Lighthouse. Volunteers and community activists are working with the Coast Guard to take ownership of the lighthouse with the goal of preserving the facility for future generations. The Coast Guard will continue to operate the light as a navigational aid. Fairport Harbor exports salt, limestone, sand, and gravel. Nearby, the nation's deepest salt-mining operation helps support Ohio's claim as one of the top salt-producing states in the nation. Salt beds, some up to 2000' deep, extend out some 2 miles under Lake Erie. The salt is remnant of the Silurian Period. Roughly 400 million years ago, a saltwater sea covered the area. As the water evaporated, the salt remained. Fairport Harbor and Cleveland are the only 2 salt-shipping ports on the Great Lakes. Walleye fishing; Bass fishing; Trout fishing; Salmon fishing; Perch fishing or just plain fun fishing charters are available from Fairport Harbor. The Old Fairport Harbor Lighthouse is now home to the Fairport Harbor Lighthouse Marine Museum, the first museum in the country devoted to Great Lakes Lighthouses. The breakwater is a popular fishing spot for non-boating fishing. Just west of the lighthouse and breakwater is the Headlands Beach State Park. Fairport Harbor was one of many last stops for fugitive slaves that would cross Lake Erie into Canada, where they could escape the bonds of slavery.